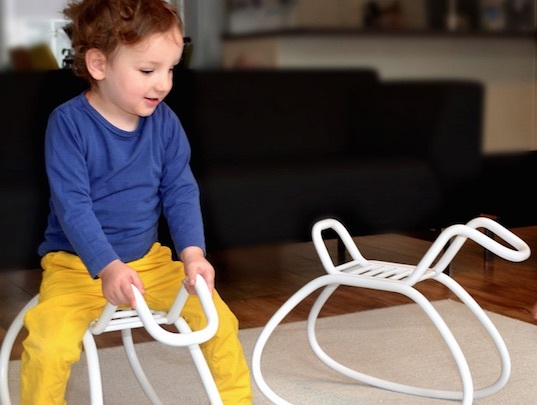 Dutch design company Blooey‘s mission is to “create beauty, do good,” and we’ll say mission accomplished with regard to their modern rocking horse. Designed by Dutch designer Remko Verhaagen, ‘Hobbel’ is the sleekest version we’ve seen of the nursery classic, which comes in fire engine red, shiny metallic silver, crisp white, and a special edition zebra-striped design that benefits the World Wildlife Fund. The kid-tested and streamlined design makes Hobbel functional and attractive. Hobbel accomplishes the enviable task of blending in with most decors while simultaneously standing out in terms of minimalist style. The steel rocking horses are crafted by hand in small batches to ensure quality and to give special attention to the horse’s details, from sanding and polishing the connections until they do a disappearing act to the naked eye, to using innovative bending techniques that give Hobbel its unique and clean-looking shape. Dutch design company Blooey's mission is to "create beauty, do good," and we'll say mission accomplished with regard to their modern rocking horse. Designed by Dutch designer Remko Verhaagen, 'Hobbel' is the sleekest version we've seen of the nursery classic, which comes in fire engine red, shiny metallic silver, crisp white, and a special edition zebra-striped design that benefits the World Wildlife Fund. The kid-tested and streamlined design makes Hobbel functional and attractive. Hobbel accomplishes the enviable task of blending in with most decors while simultaneously standing out in terms of minimalist style. The steel rocking horses are crafted by hand in small batches to ensure quality and to give special attention to the horse's details, from sanding and polishing the connections until they do a disappearing act to the naked eye, to using innovative bending techniques that give Hobbel its unique and clean-looking shape.